Parents of a girl in a France named her Nutella, after the delicious chocolate-hazelnut spread, but a court has ordered her to named Ella instead because "it is contrary to the child's interest to have a name that can only lead to teasing or disparaging thoughts." While I don't support named children after Nutella, I do wonder how such a case ever found its way before a judge. Another piece of evidence has surfaced to demonstrate how far American society has fallen from decency and consideration. Staff at the City University of New York's Graduate Center have been cautioned against referred to students as "Mr.," Mrs.," or "Miss" So-And-So because using such titles once thought appropriate in civil society may now be interpreted as disrespect. If that's the case, I suggest we all stay home and never think of going outside again. Catholics in Boston are being purposely excluding from serving on the jury in the trial of Dzhokhar Tsarnaev - the "Boston Bomber" - because of the Church's teaching regarding the application of the death penalty. A survey from the Pew Research Center indicates the majority of Italians believe most Europeans would call Italy the mostly like nation of the European Union to be named the least trustworthy. Greeks, curiously, see themselves as the most hardworking of the European peoples. The origins of words often intrigue, particularly in the way we have frequently changed the original and fundamental meaning of a word (as in our use of the of the word "awesome" today). Because I do not spend a great deal of time studying the origins of words, sometimes an awareness of an original meaning simply hits me, as it were, out of the blue (usually when I'm walking along thinking about other things without paper to write on). Today, though, as I went on my daily walk through the streets of Rome listening to podcasts of Catholic Answers Live (this time to stock up on Dr Pepper before five forecasted days of rain arrive over Rome), I listened to Steve Ray (with whom you really should go on pilgrimage) explain the original meaning of the word denomination. The word first made its way into the English language in the late 1300s, coming from a French word (the Norman conquest of 1066 began a long history of the incorporation of French words into the English language, like pork and beef) of Latin origins. The English word "denomination" comes from the French word "denominacion," meaning, "nominating" or "naming." The French word "denominacion" comes from the Latin word denominationem, meaning, "a calling by anything other than the proper name." The Latin word denominationem has its origins in another Latin word, denominare, meaning, "to name." In the 1650s the word denomination was applied to currency and in 1716 it was given an additional, new meaning: "a religious sect." Calling them denominations disguises the historical fact that none of the various Protestant denominations are what Jesus established when he said to Simon Peter, "And so I say to you, you are Peter, and upon this rock I will build my church, and the gates of the netherworld shall not prevail against it" (Matthew 16:18), or when he instructed his disciples, "If he will not listen to them, tell the church" (Matthew 18:17). Notice that the word church is singular in both instances; Jesus establish one church, not several. And if none of the Protestant denominations have a historical beginning prior to the 1500s, they simply cannot be the church to which Jesus referred. As part of Catholic Schools Week, which is currently being celebrated in the United States of America, the Most Reverend Thomas John Paprocki recently sat down for a live web chat with the seven Catholic high schools to answer fourteen questions posed to him by the students in the Diocese of Springfield in Illinois. What is our best strategy for reversing Roe vs. Wade? What are some bits of advice or strategies to help those who struggle with their faith? Do Catholic schools have a common curriculum? What can I do to keep my faith and not lose sight of God in our changing society? How should the Church better show compassion for those in the LGBTQ community? Is Pope Francis' recent statement about not breeding like rabbits a contradiction of Church teaching? What changes have you seen in the Church in the last five years and what changes do you predict will happen in the next five years? What do you say to those who do not believe in God because of evil, illness, and unanswered prayers? What is your advice for those preparing for college? How do you feel about the country wanting to take the word God out of the pledge of allegiance? What are your plans to address the post-Confirmation to pre-marriage age group? Who is your favorite male and female saint, and why? Is it possible for a lay person to perform an emergency exorcism? Lest we forget: How do you kill 11 million people? UPDATE (02-09-15): Boko Haram is just as vicious. Why does the Islamic State get all the headlines? UPDATE (01-28-15): Boko Haram's Media and The Islamic State Connection? UPDATE (01-13-15): Why did the world ignore Boko Haram's Baga attack? Boko Haram have just murdered 2,000 people in Baga - so why aren't we talking about it? Bishop of Maiduguri on Boko Haram: Who shall separate us from the love of Christ? UPDATE (9-5-2014): Is This the World's Next Major Terror Threat That Could 'Explode Any Day' (And It's Not the Islamic State)? On Syrian and Iraqi Refugees: "Everything Has Changed for the Worse"
UPDATE (01-26-15): Cruz Files Bill to Ban American Islamic State Fighters from Returning to U.S.
UPDATE (01-22-15): MSNBC: We have a strategy against ISIS? Could the Vatican be in ISIS' cross hairs? UPDATE (01-17-05): Why do Lebanon's young men join ISIL? UPDATE (01-09-15): Who are the Kharijites and what do they have to do with IS? He walked along a little farther and saw James, the son of Zebedee, and his brother John. They too were in a boat mending their nets. Then he called them. So they left their father Zebedee in the boat along with the hired men and followed him (Mark 1:16-20). What is it that keeps us from abandoning our nets to follow Jesus? What ties have we set in our lives that we refuse to sever? To what do we keep looking back when the Lord calls out to us, "Come after me"? Unless we abandon ourselves to the care and call of the Lord Jesus, we cannot fully answer his call to "repent, and believe in the gospel" (Mark 1:15). Let us then strive, with the help of his grace, to let no one or no thing keep us from abandoning ourselves to him. If we follow after him without reserve, we will on the way that leads to justice and to the satisfaction of every desire of our hearts. What will you think about this weekend? Weekends can often be filled with a great number of distractions - oftentimes good in their own right - which sometimes keep us from making good use of the additional free time a weekend affords us. Used properly, a weekend is a time to rest, to enjoy the company of family and friends, and for growth in the spiritual life. Therefore, you must solicitously consider and frequently reflect that God, who does not lie, has promised to those who believe in God and love God: the removal of all evils, the company of the saints, the fulfillment of all desires in God who is the font and final goal of all goods - God who is so good as to exceed every wish, every desire, every imaginable estimation. Moreover, God regards [you] as worthy of such a good, if indeed you love and desire God above all else, and for the sake of God alone; and so you must struggle to reach with every desire, affection, and choice of resolute goodness. "Creep down into the heart of Jesus," said Saint Marianne Cope, adding, "He alone can comfort you in your supreme hour of sorrow." When she offered this counsel in 1904, she had already been living and working among the lepers of Molokai for sixteen years and would continue to live among them for another fourteen until her death on 9 August 1918. For all our days pass away under your wrath, our years come to an end like a sigh. The years of our life are threescore and ten , or even by reason of strength fourscore ; yet their span is but toil and trouble; they are soon gone, and we fly away" (Psalm 90:9-10)? Has not man a hard service upon earth, and are not his days like the days of a hireling? ... My days are swifter than a weaver's shuttle, and come to their end without hope (Job 7:1, 6). But like Saint Damien before her - whose work she continued and upon which she improved - she was not content to leave their lives filled with misery; rather, she sought to bring a ray of hope, the Light Unfailing, Jesus Christ, who knows well their suffering. Indeed, as he hung upon the Cross, similar words passed his lips: "My God, my God, why have you forsaken me" (Mark 15:34). Jesus quoted from Psalm 22, which begins as a great lamentation but turns toward tones of great hope: "For he has not despised or abhorred the affliction of the afflicted; and he has not hidden his face from him, but has heard, when he cried to him" (Psalm 22:24). Mother Marianne's greatest desire was to lead her lepers deeper into the love of Jesus Christ, and what better way to do so than to urge them to "creep down into the heart of Jesus"? We know that the heart of Jesus is open to us because "one of the soldiers pierced his side with a spear, and at once there came out blood and water" (John 19:34). What is more, Jesus invited Saint Thomas the Apostle, saying, "put out your hand, and place it in my side" (John 20:27). His side remains open to us; the way to his heart has not been closed! We may not know the misery of those lepers torn from their families, who suffered from hunger and cold and boredom and pain, but in each of our lives there are moments of doubt, moments of grief, moments when all seems lost. Mother Marianne knew them, as well, but she also knew the cure for them: "Creep down into the heart of Jesus." To enter into his heart is not easy. It requires that we let down our guard and allow ourselves to be vulnerable, to be vulnerable to love. It requires a recognition that we do not have all of the answers, that we are not in control. It requires us to simply trust and, as such, is very difficult in times of hardship and fear. This is why she tells us to "creep" into his heart, one step at a time. From her place in the heavenly kingdom she continues to speak these words to us. She made her home, like her spiritual father Saint Francis of Assisi, in the wounds of the Crucified Lord and in his heart, in the sign of his love, found the strength to tend to the dying and to prepare them for death for thirty years. Let us seek to do the same, that resting securely in the peace of His heart, we, like Mother Marianne, may attend to the needs of our brothers and sisters who long for joy and hope. 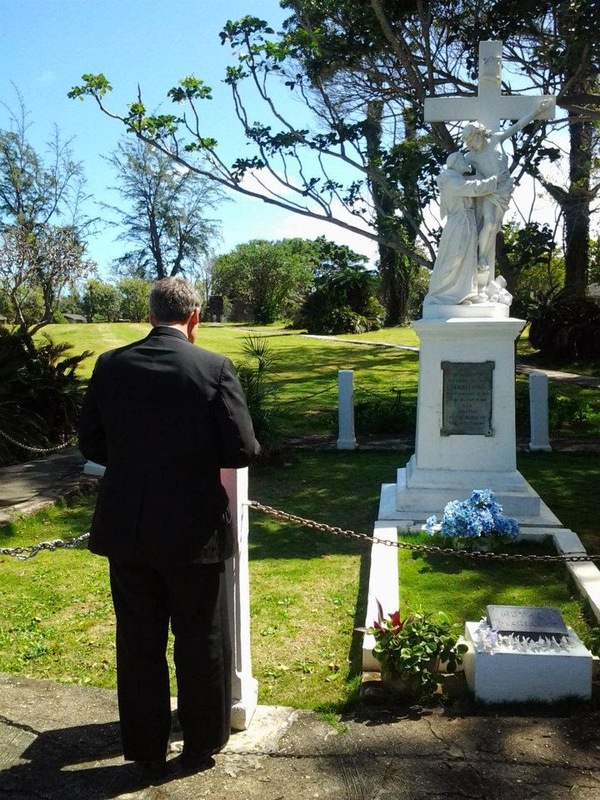 Praying at her original grave at Kalaupapa, 6 March 2013. Saint Marianne Cope, pray for us! The National Catholic Register's Doreen Abi Raad recently sat down with His Excellency the Most Reverend Barnaba Yousif Habash, Bishop of the Syrian Catholic Eparchy of Our Lady of Deliverance, which has its see in Bayonne, New Jersey, to discuss the dire situation of the Christians in Iraq and Syria. Bishop Habash is a native of Qaraqosh, Iraq. Why? The jealousy of the devil is what happened. This storm, what happened to them, you can easily call it the jealousy of the devil. They are Christians; they are authentic people. They are hard workers for peace. They love the others. They love their country. And all of a sudden, they have been told it’s not allowed for you to continue with Christianity without paying a tax, although we are in our land 600 years before Islam, although we were the teacher of the prophet of Islam. We were the teachers of the language of Islam; we were the teacher of the law of Islam; we were the engineers of the buildings and cities of Islam, since the beginning, until recent days. We are their doctors, as we were before; we are their professors. We taught them everything, until the last hours of our existence. Their sick were brought to our hospitals, treated by our doctors. I visited more than 500 families in tents and uncompleted buildings. They said to me, “You are most welcome, Bishop.” And they have absolutely nothing. “Oh, you know what, Bishop, yes, we lost everything, but we still have our faith in the Lord Jesus.” Honest to God, almost every family said this: “We give thanks to the Lord. 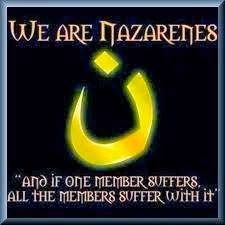 We are still Christian.” And our people were very convinced that, although they had been through a very evil storm, the arm of God saved them. They understood this very well. I came from Irbil, I saw the miserable people, the catastrophe, and I have to speak with diplomatic words and to hide the crime, the crime of the world? Because what happened is truly genocide: uprooting innocent people of the wonderful and peaceful civilization of Christianity in this part of the world. But, unfortunately, when you speak about human rights in Europe or America, it is only for your people inside your country. But concerning the outside, the other human beings: “No, we don’t care; it’s their problem.” I say that about the (Western) politicians, not ordinary people. Americans are the most generous people, the most fine, with their love and with their respect. But the foreign politics is from hell. Nobody cares about us. When we speak out, we get the routine answer from the Islamic religious or the Muslim authorities: “They are non-Muslim, the Islamic State.” How can it be, they are non-Muslim? All of them are Muslim. Or: “They work outside of the Islamic world.” So who is the financial source of ISIS? It’s very clear; it’s Saudi Arabia. Unfortunately, no one has the guts to say that. Who is fighting Syria? Who is supporting and financing the war against Syria? It’s very clear: Saudi Arabia. Please pray for our people. They do need prayer. And these prayers will save us, surely, surely. All the iron gates made by politics, by religion, will be broken; all the Christians will be liberated like Peter, when he was in prison and the angel brought him (to safety). Last week it was announced that the U.S. House of Representatives would vote on January 22nd - the anniversary of the Supreme Court decision Roe v. Wade that legalized abortion in the U.S.A. - on H.R.36, the Pain Capable Unborn Child Protection Act sponsored by Representatives Trent Franks (R-AZ) and Marsha Blackburn (R-TN), a piece of legislation that would make abortions after the 20th week of pregnancy once again illegal. Initially, I thought it was nothing more than yet another Republican public relations stunt, especially given the hundreds of thousands of people - particularly young people - gathered now in the nation's capital for the March for Life. Some small part of me, however, held out hope that this time they actually meant to do something significant toward upholding the natural moral law in our legal code. I was foolish. Moments ago, on the eve of the announced vote, Republican lawmakers decided to pull the vote. Out of fears they would lose the votes of women and young voters. Given the data, this only shows how very much out of touch Republican politicians are, and how lacking they are in integrity. According to a recent CNN poll, 20% of Americans oppose all abortion and 38% oppose in most circumstances. That's right; the majority (58%) of Americans oppose abortion. Yet the Republicans are worried of losing the vote. Cowards. Following a poll published in May 2010, Gallup described being pro-life as "the new normal". In 1995, 33% of Americans identified themselves as being pro-life; in 2010, 47% identified themselves as being pro-life. (Remember, just five years later, 58% oppose abortion). In 2015, Yet the Republicans are worried of losing the vote. Cowards. On the other hand, in the same poll, in 1995, 56% of Americans identified themselves as being pro-choice; in 2010, that percentage fell to 45%. Yet the Republicans are worried of losing the vote. Cowards. A recent poll from Marist University shows that 84% of Americans support a ban on abortions after the 20th week of pregnancy. Faced with these results, even Slate had to acknowledge that "even the most pro-choice people aren’t sold on abortion rights beyond the first trimester." Yet the Republicans are worried of losing the vote. Cowards. A poll from Quinnipiac University found that even 46% of democrats favor a ban on abortions after the 20th week of pregnancy. Yet the Republicans are worried of losing the vote. Cowards. The same poll found that 56% of independents favor a ban on abortions after the 20th week pregnancy. Yet the Republicans are worried of losing the vote. Cowards. The same poll found that 57% of voters between the ages of 18 and 29 and 61% of voters between the ages of 30 and 49 support a ban on abortions after the 20th week of pregancy. Yet the Republicans are worried of losing the vote. Cowards. What is more, the same poll found that 61% of men and 59% of women support a ban on abortions after the 20th week of pregnancy. Yet the Republicans are afraid of losing the vote. Cowards. To be fair, President Obama threatened to veto the Pain Capable Unborn Child Protection Act. Some would say, then, that voting on the legislation would be a waste of time. To that claim, I answer that it would not at all be a waste of time. It would, rather, be an expression of the will of the people and this is never a waste of time. We do, after all, live in a representative republic and it is high time our politicians began governing with the will of the people instead of their own wills aimed only at re-election. It would also demonstrate to the voters that the Republicans mean what they say, which isn't the case at the moment. In an effort to appease those of us who are furious at their cowardice and to make it look as though the Republicans actually care about being Pro-Life, they will vote instead (so they say, but what's to stop them from pulling this vote, too?) on the No Taxpayer Funding for Abortion and Abortion Insurance Full Disclosure Act of 2015. With whom is the Father well pleased? Did Jesus make angels in the winter snow? Why should you go pilgrimaging with Steve Ray?